This week's bread was another recipe that was new to me: Artos, or Greek celebration bread. There are variations depending on the holiday, but I chose Christopsomos, or Christ Bread, which is made for the Feast of the Nativity, or what we typically refer to as Christmas. Slightly sweet, spicy, and filled with nuts and dried fruit, this bread was both delicious and beautiful. 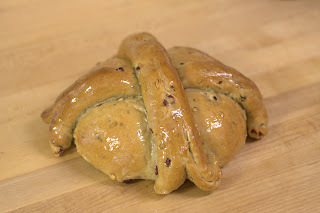 It reminded me a lot of the Italian Easter Bread my Mom always makes on Easter, although that doesn't have the spices. I made two batches of this bread and shared with a few different people, as it makes a gigantic loaf! I chose to use the poolish starter, since I don't yet have any barm going. I used melted butter instead of olive oil in both batches. Also, I used toasted hazelnuts in one batch and slivered almonds in the other. We're not big walnut fans, but both of the other nuts were quite nice along with cranberries and currants. With the first batch, I forgot to start my poolish the night before I wanted to bake, so I made it in the morning. Then I got home late and rushed my dough through rising by putting it in a slightly warm oven. It worked, but the result was less than beautiful. It made one huge loaf that visually looked a lot like stretch marks! It was yummy, but I wanted to try again and see if I could do better on the shaping. I started my second batch a few days later, with some of the leftover poolish, which had now had time to develop a little more character. I left plenty of time for slower rises, at room temperature, which was probably about 65 that day. Also, I decided to make two smaller loaves instead of one large one. The dough rose beautifully, was much smoother, and didn't have the uneven appearance of my first loaf. I'd thought the first loaf came out a bit dark so I tented the second batch with aluminum foil after the first twenty minutes of baking. I used the glaze on the second batch, and while it was a bit sticky, it really brought out the golden color of the crust and made it look pretty. It also had a nicer texture, not quite as fluffy, but still very soft. I still had one cup of poolish, so I decided to make one more batch of bread. I left all the spices and orange rind out of the final batch and shaped half of it into hot dog and hamburger buns for our weekend cookouts. The result was very nice, soft buns that held up well to the meat but didn't overwhelm it. I actually still have half that dough in the fridge and will make pizza with it tomorrow night. The Christopsomos was wonderful, and I will definitely make it again. I don't know that I will do the fancy shaping, but who knows! I thought it would have made great toast or french toast but really liked it plain with some butter. Moving along this week to bagels. I haven't made those in a very long time, so that should be fun, and also is one the kids will likely enjoy helping out with. Sounds very yummy. The smell of bread has been getting to me lately. I think it is time to make some myself. Nothing like freshly baked bread with gluten or NOT! I wish I could try yours. Nice! I loved the taste of this bread. Yours looks super. You've inspired me - I ordered the book, and am waiting to see what to try first. You have three very young kids, and mine are mostly older, so there's really no excuse not to dive in. Rebeca, I honestly don't know why I haven't visited in such a long time but I've missed reading your blog and have thought about you. Have thoroughly enjoyed your bread posts. You make it look so easy! I need more motivation to cook and bake. My husband is our weekly bread baker so I may have him read your posts - he'd enjoy them. Best wishes to you on your Challenge! Your kids are certainly growing! Raphael is so big! He has such a serene look to him - is this the way he is or did you just happen to capture this look on film? Will visit again, sooner next time. Take care my NW friend!